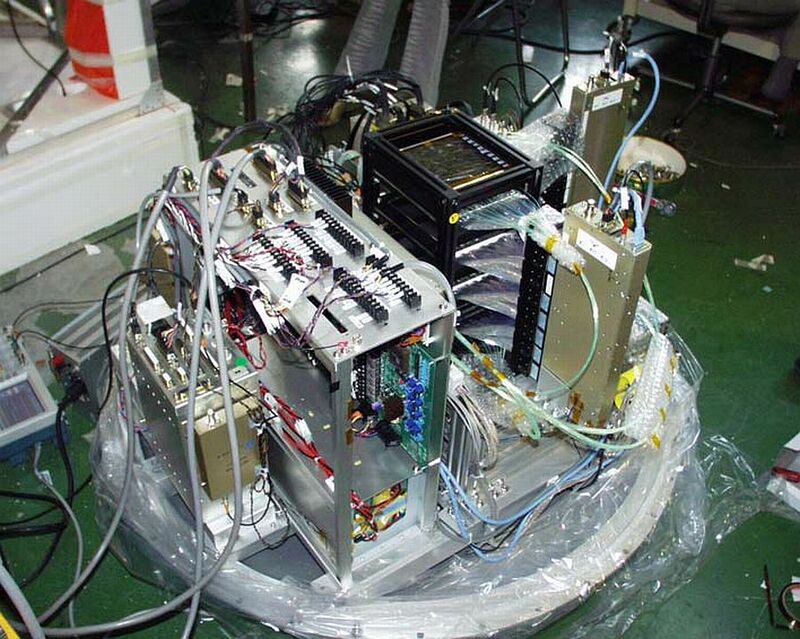 In the scheme at left can be seen the distribution of the elements that composed the bCALET-1 instrument which is a 1/64 scaled down version of the full sized experiment for the ISS (click to enlarge). The upper part is an imaging calorimeter (IMC), composed of four layers for shower imaging. Each layer consists of a tungsten plate and two scintillating fiber belts arranged in the x and y direction and composed of 128 scintillating fibers of 1 mm2 of diameter each. The dimension of the IMC is about 128 mm x 128 mm while the total thickness of the tungsten plates equals to 1.3 radiation length (RL). 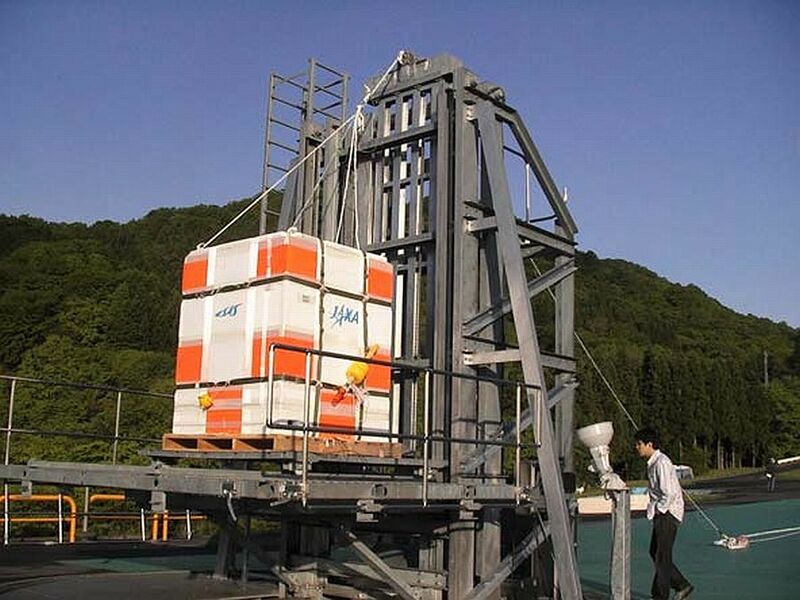 The image measured by the IMC is used for estimation of the incident direction and shower development of cosmic rays. Signals of each fiber are detected by 64-anode Photomultipliers (PMTs) and then read out by eight front-end circuit modules reading each up to eight of the PMTs. In the lower part of the instrument lies the total absorption calorimeter (TASC) with 6 scintillator layers each composed of four Bismuth germanate (BGO) logs measuring 25 mm2 of cross section. Alternate layers are orientated 90 degrees each other to provide x and y coordinates. 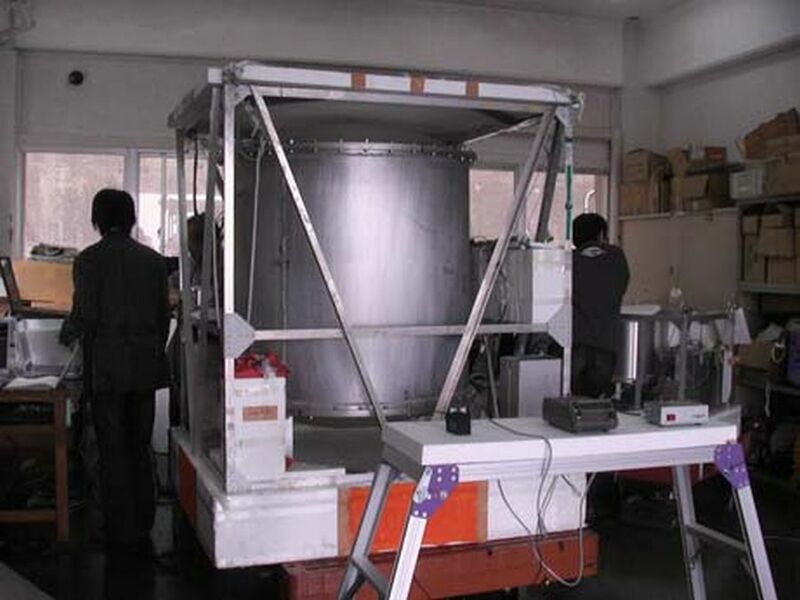 The total thickness of the TASC is 13 RL and it's main function is to measure the shower development to determine the total energy of the incident particles and to discriminate electrons and gamma rays from protons. The BGO signals are measured by a single photodiode attached to each log and digitized by pulse height analyzer modules. 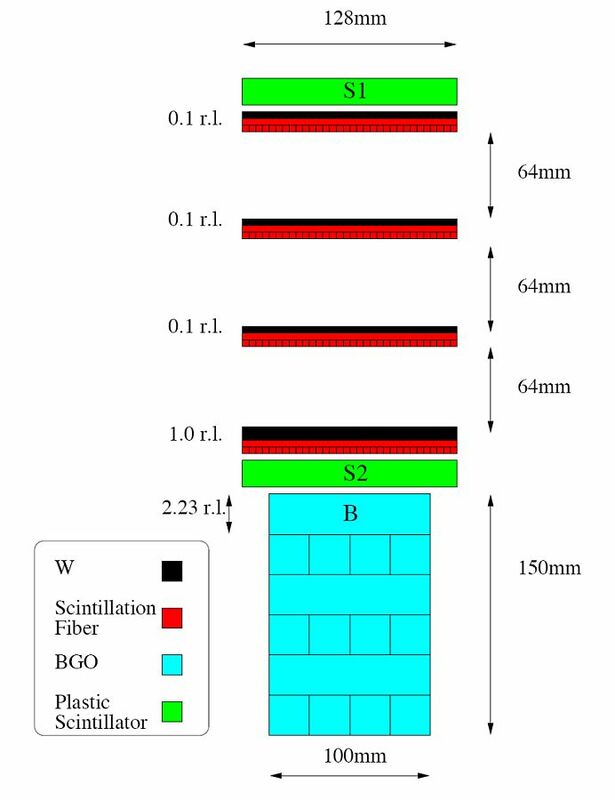 Two layers of 20mm-thick plastic scintillators (S1, S2) and the top layer of the TASC (B) are used as trigger system working in two modes: one to obtain only showering events and the other to record gamma-ray events. S1 act also as a veto counter being adjusted to eliminate effectively the background proton events. 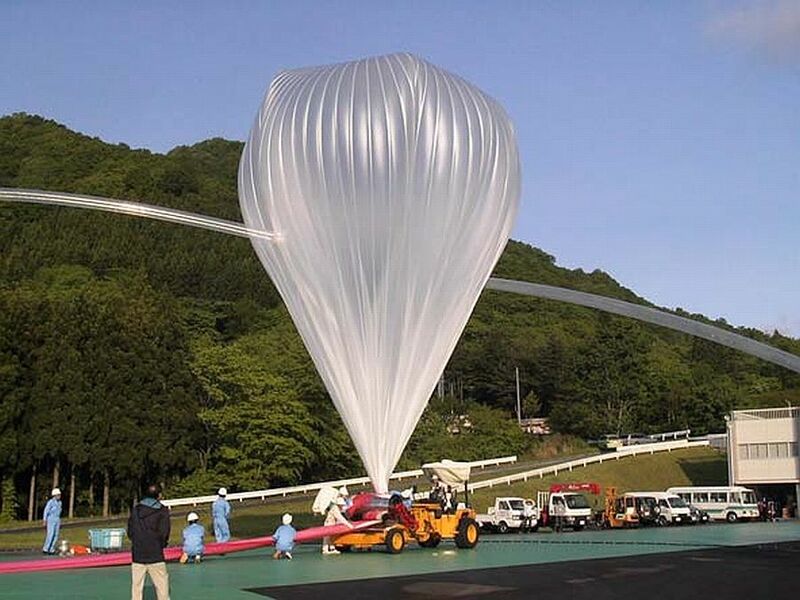 The balloon was launched by vertical method at 6:00 local time on 31 May 2006 and after a nominal ascent it drifted eastward over the Pacific Ocean. 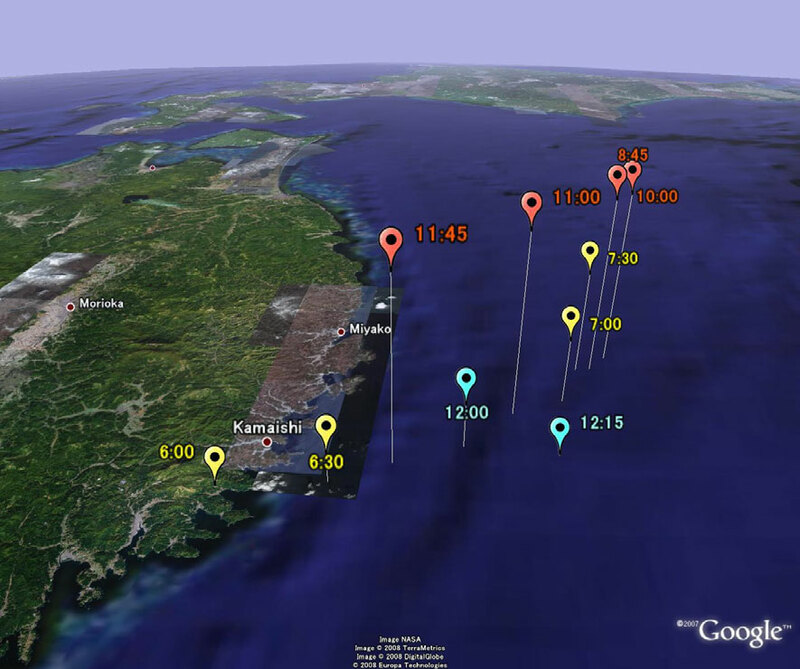 After reaching the float altitude of 35 km it started a westward path during the phase of levelled flight wich lasted 3 hours and 30 minutes. 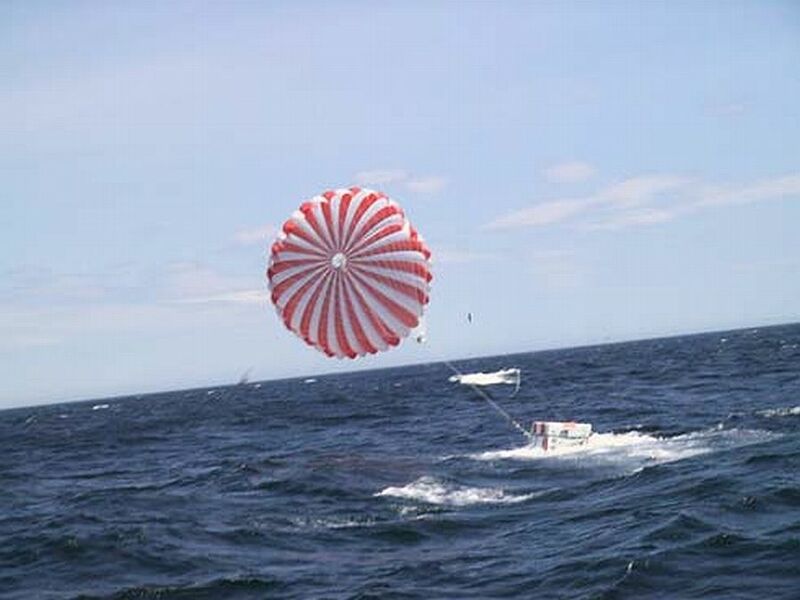 The flight was terminated after 6 hours after launching and the payload was succesfully recovered from the ocean. This was the first flight of the instrument and consisted in a scaled version (1/64) of the experiment to be installed in the future in the ISS. During the 3 hours and a half of levelled flight bCALET-1 collected about 3000 electron trigger events and near 40.000 gamma-ray trigger events, and cosmic rays showers were clearly observed by the calorimeter. The scientific team obtained data about the electron flux in the energy range between 1 and 10 GeV. This result was consistent with previous estimations. Something similar occured with the obtained flux above the rigidity cutoff range which showed good agreement with the results obtained by other balloon-borne instrument called BETS.